Early Tax Planning 2018 Tax Year - There is no better time! On July 31, 2018 at 12:00 p.m. (Eastern Time), join us for a free webinar with U.S. tax attorney Alexey Manasuev, LL.M. 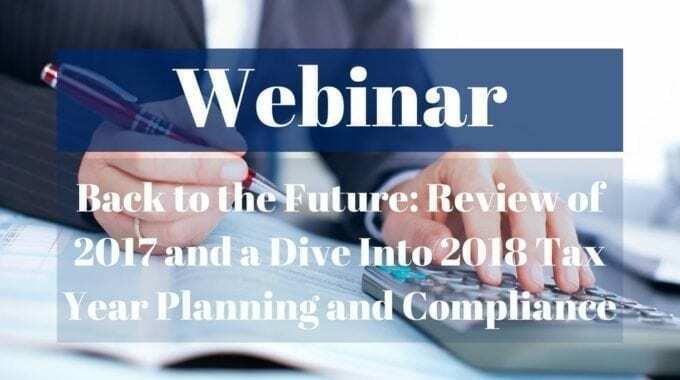 (Int’l Tax), NYU, TEP, and U.S. tax accountant Brandon Vucen, CPA, CA, CPA (IL), MST, who will discuss important 2018 tax compliance and planning considerations, most recent tax developments, and recap lessons learned during the 2017 tax season with an eye toward the next filing season (for the 2018 tax year). Now, while the 2017 tax season is nearing its end, it is a great time to look ahead to the 2018 tax year! The end of 2017 and beginning of 2018 was heavily focused on the new tax law changes and how taxpayers can comply with the new law. This is a perfect time to begin focusing on tax planning strategies so that you and your clients are well prepared for the upcoming tax season! This webinar will fill the gaps for the 2017 tax compliance and highlight key tax developments. We will discuss real-world issues dealt with over the past tax season, solutions that were implemented and discuss ways in which you can avoid common mistakes when dealing with U.S. taxes. We will supplement this discussion with planning guidelines for the 2018 tax year! To learn more, register and gain the knowledge you need to understand your or your clients’ compliance requirements, planning opportunities, and navigate the complexities of U.S. taxes.